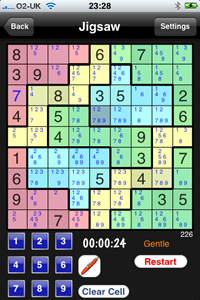 WARNING: You are on the Weekly 'Extreme' Killer Sudoku Sudoku Page. 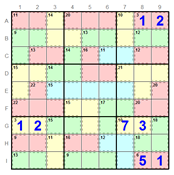 Killer Sudoku is a fiendish variant of Sudoku - the same 9 x 9 board with rows, columns and nine boxes that must be filled in with all the numbers 1 to 9. 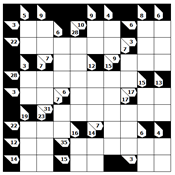 But instead of seeing some starter clues where some cells are completed for you, in killer sudoku areas of the grid are "caged". 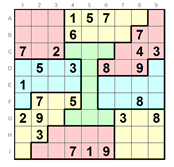 Each cage contains a single number which is the sum of all the solutions in that shape. 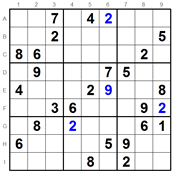 You have to use this information to crack the Sudoku, but all the normal strategies of Sudoku still apply. A cage of two cells containing a target of 3 will must contain cells with the value 1 and 2. 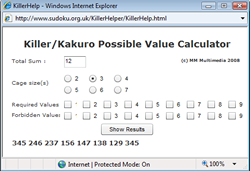 (We conform to the Killer convention that no cage will contain a duplicate number even if it is within the rules of sudoku). Killers strategies are explained on our forum here and on this external site here. A list of Cage/Value combinations is available here. All Extreme puzzles have a single solution and at least one logical solve path, although this might be obscure to say the least. The deadline is Saturday night, any time up to midnight. You should type or Copy and Paste 81 numbers here. They can be in a square or in one long line. All punctuation, white space and line feeds are ignored - so it does not have to be 'clean'. We'll check that it contains 81 numbers before submitting.